One of the earliest of Arugulas available with young leaves ready to harvest just a few weeks after planting. The compact plants are slow to bolt and disease tolerant. The leaves keep well after picking. Enjoy Arugula’s mild tangy flavor for salads, sandwiches, or lightly cooked with fish or poultry. A great source of vitamins A and C, and very high in calcium, and potassium. Superb for eating fresh or added to a variety of dishes. Add leaves to salads, sandwiches or use as a garnish. Cook like spinach and cover with butter or cream sauce. Wash fruits, vegetables and herbs thoroughly before eating. Plant in a reliably sunny spot. Prefers fertile, well-drained soil and cooler temperatures. Keep soil moist, watering freely in dry weather. The leaves should picked when young; about 2-3" (5-8cm). Once the plant starts to flower, or "bolt", the flavor turns bitter. 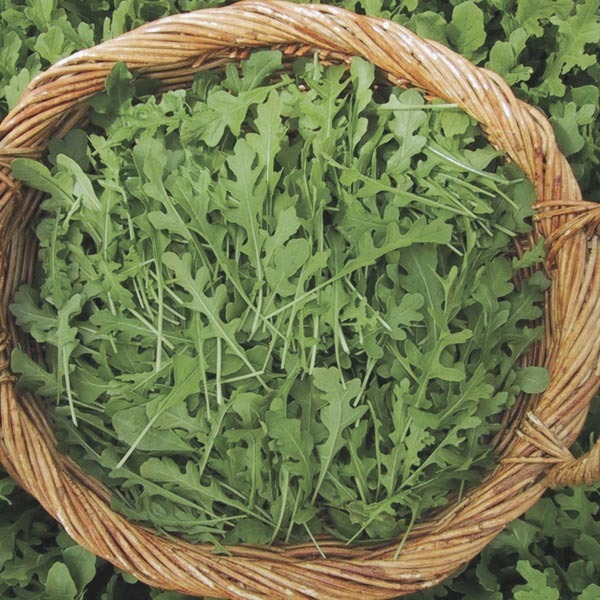 To enjoy Arugula all season, simply plant a new crop every 20 to 30 days so there will always be young plants for harvesting.